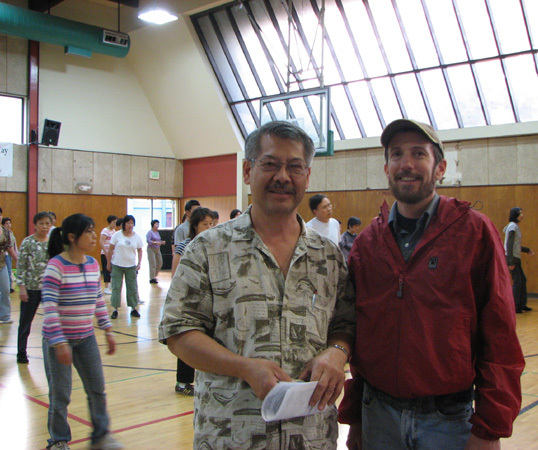 We headed out to visit the early evening Line Dancing class at the Lincoln Rec Center. From our previous visit, we knew that the class, a weekly event, would be well attended. Matt and James, our videographers, were coming along so that we could talk to the dancers about their experience of Lincoln Park and the neighborhood. As we were walking along 10th Street and noticed new signage: we were very impressed and surprised with their appearance! When we had originally conceived of this project, we had envisioned creating a self-guided walking tour that would be marked with just this sort of sign. We were discouraged from following this path from someone in the City, as our streets are already overloaded with visual info at this height. So, it is good to see that some department in the City decided to promote local community oriented attractions downtown. 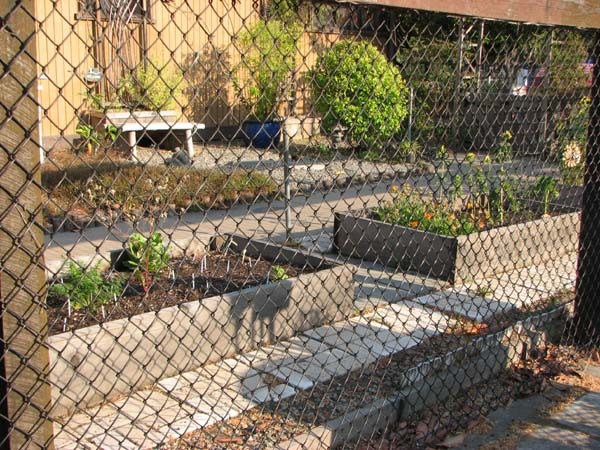 Near Lincoln there is a very sweet community garden, full of sunflowers and edible greens. Whenever we go to Lincoln, we always picked up some of the wind strewn sidewalk tumbleweeds, aka, stray newspapers and plastic bags. 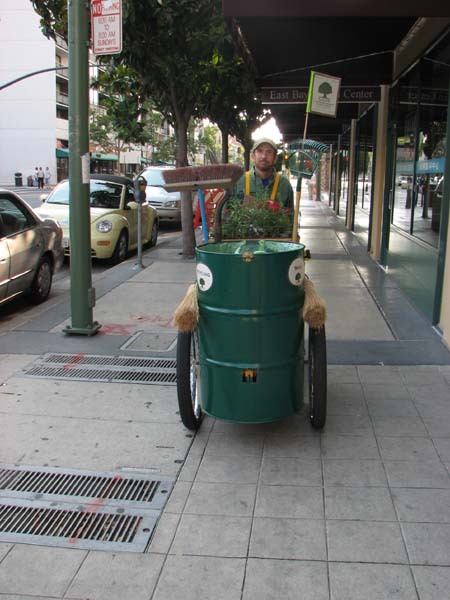 No matter that crews clear out the surrounding foliage: the trash propagation is constant. While cleaning, we met with a community member who is part of a group that meets monthly at the Lincoln Rec Center to learn how to work with the City. They clean the streets 4 times a year and they also get training on how to respond to various emergencies. 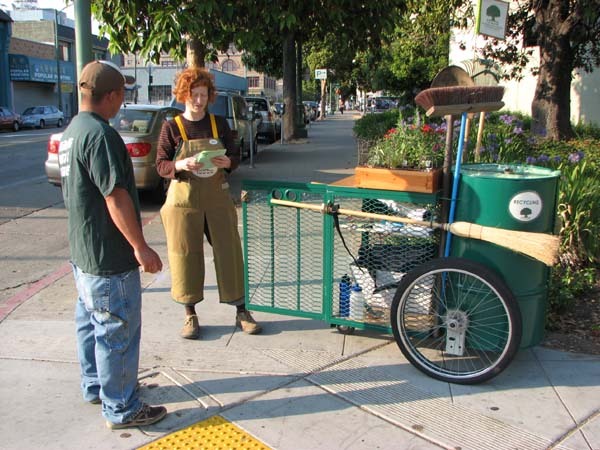 As the City’s funds disappear, it is more crucial that communities learn how to take care of their neighborhoods in various ways. 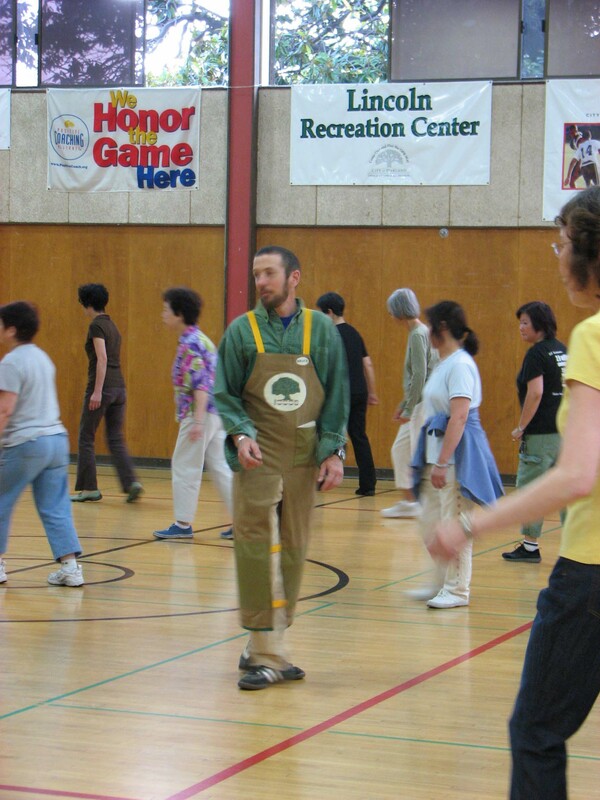 On Monday evening, we went to the Lincoln Rec center’s line dancing class. The Rec Center, along with hosting s wide variety of activities for kids, has, in the last few years, offered classes for adults and seniors. 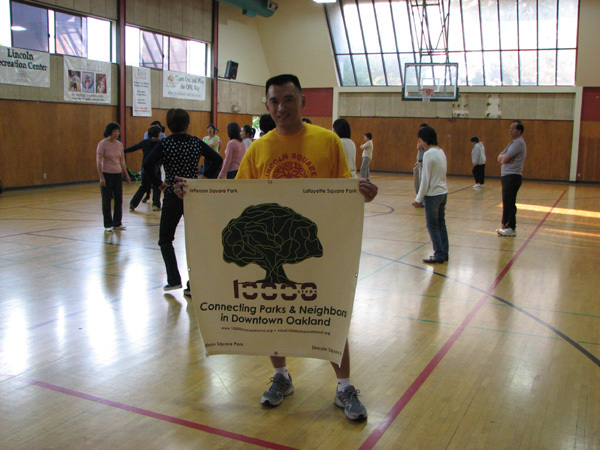 Every Monday evening and Saturday morning, the Center’s gym is packed with Chinatown neighbors learning a variety of line dances to a wide range of music. One of the big successes of the line class, aside from it being a totally fun time, is that no partner is required! 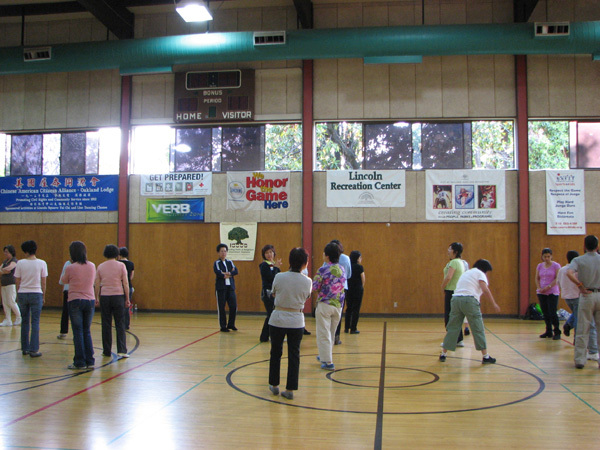 The agile teacher, who amplified instructions are given in a mixture of Chinese and English, is sponsored by the Chinese American Citizens’ Alliance, a vital advocacy group. 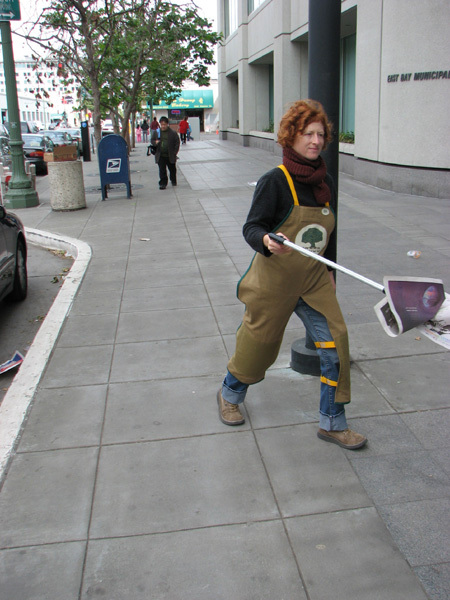 The CACA was started in 1895 in San Francisco “to promote citizenship, to better the community, and to combat the anti-Chinese sentiment.” Today, with lodges throughout California and other states, members dedicate themselves “to civic pride, community service, and good citizenship” by engaging in numerous community projects. We gave a short presentation, translated by Ed Yu, President of the CACA, during the class’ break. 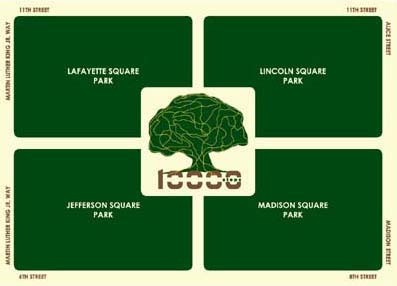 We plan to visit the class in a few weeks to talk with some of the dancers about their memories of Lincoln Square Park. Lots of people came up to us after our presentation to learn more about the project. But then the music started again and it was time to dance! We were making plans for future stewardship activities with the teens. 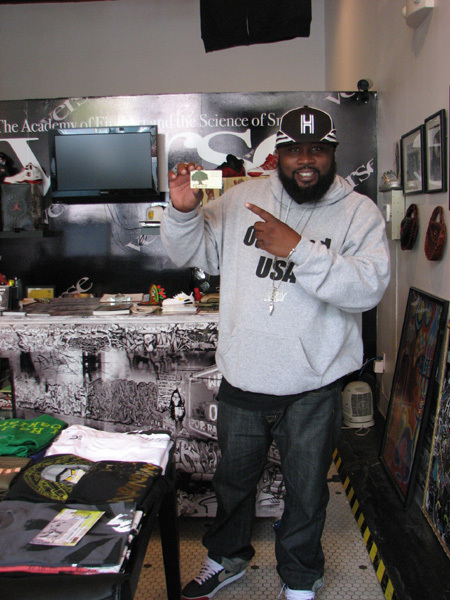 One thing that they desperately need, Lee told us, was a way to make their mark on the place. Ideally, she would love to see the small historic park building that is currently used for the Family Bridges program converted into a teen space with games, computers and a place just to hang out. 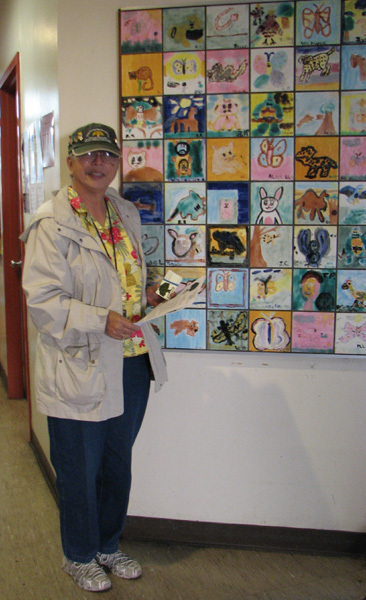 The tile project at the center’s entrance is over thirty years old; Lee would like the teens to make a new mural so that their voice is present. 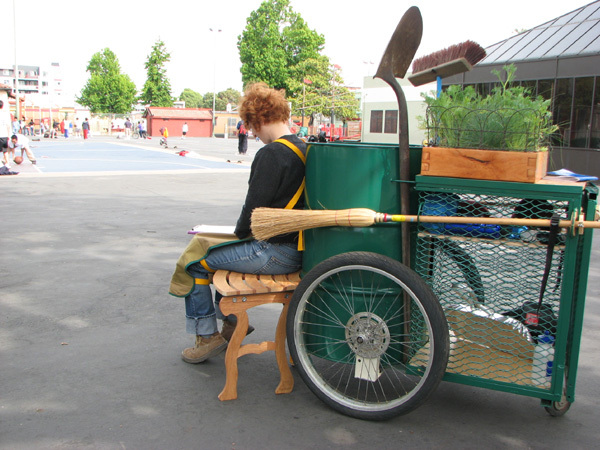 After talking more about some of the park’s needs, we all decided that we would work on a park bench project with the kids. 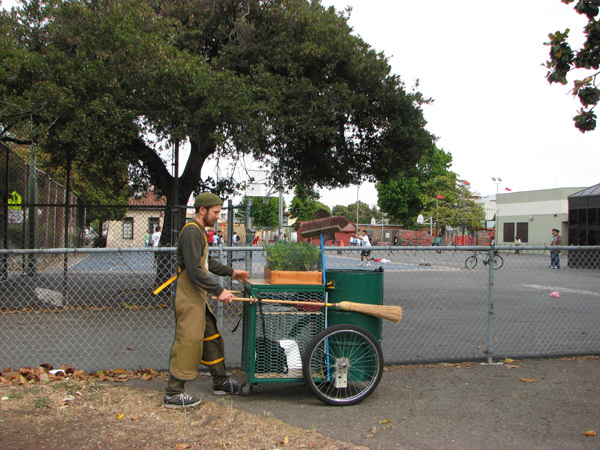 The park needs more benches; we would help the kids learn how to build the benches and then they could paint them as mini-murals. We are now raising money for the project. If YOU want to help, you can make a tax-deductible donation to 10,000 Steps through our partner, Friends of Oakland Parks and Recreation. We went to survey Lincoln Square Park on a sunny Saturday afternoon during Memorial Day weekend. 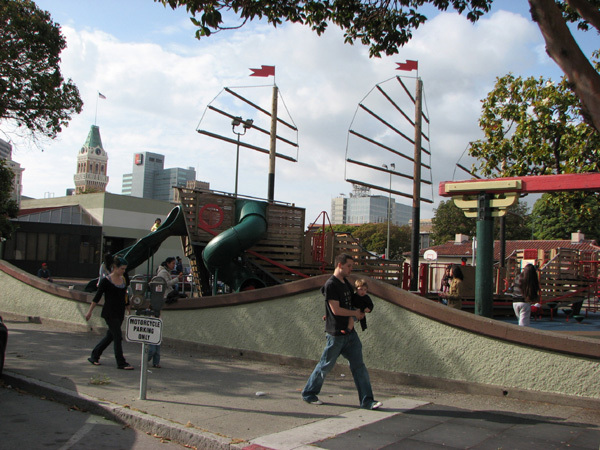 Lincoln, located in the heart of Chinatown on 10th Street and Harrison, is very different from the other park squares: it has a dynamic Rec Center that hosts daily activities for kids and adults. 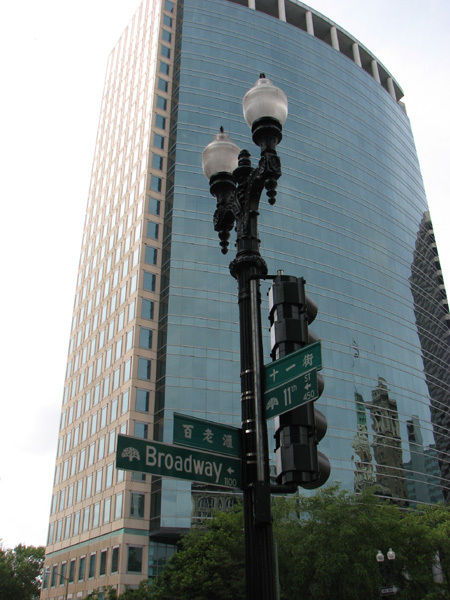 As we headed towards Chinatown, the city was pretty desolate. 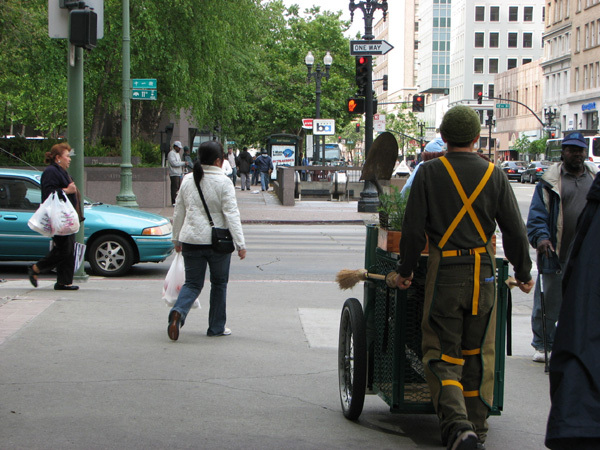 As soon as we hit 11th and Broadway, one edge of Chinatown, the sidewalks were crowded with shoppers. It felt like this is where the city truly began. 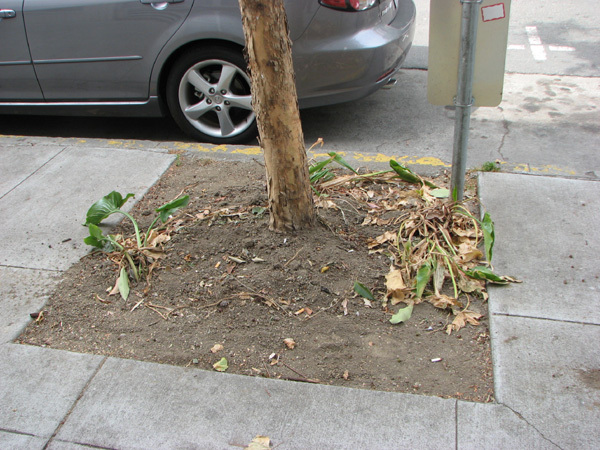 We did a little bit of sidewalk stewardship along the way. The majority of the park is asphalt, with a large portion dedicated to the junkship play structure, which was full of kids and watching parents and grandparents. The rest of the park is open space for basketball and other ball games. 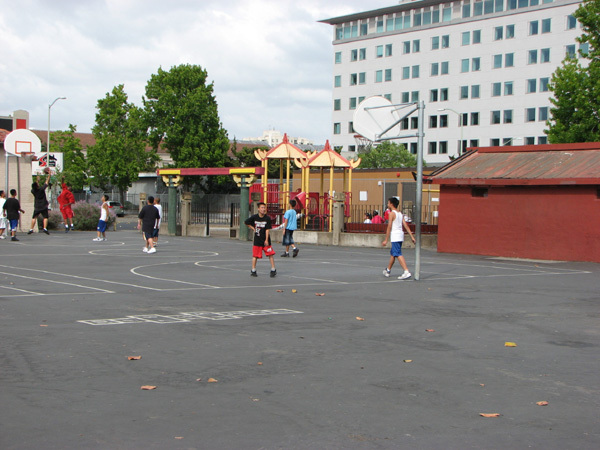 When we were there, we saw three or four basketball games going on with black, asian and latino kids playing together. 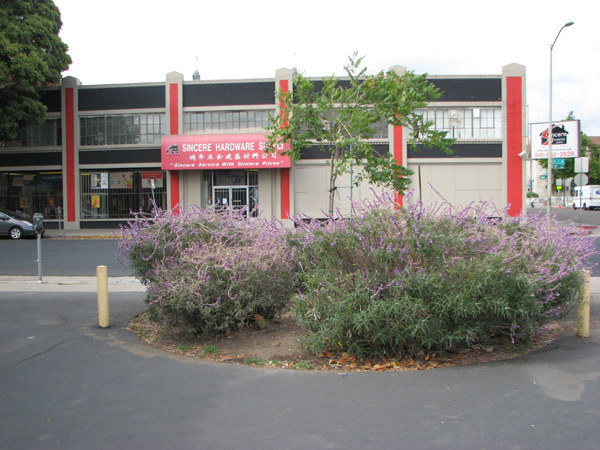 This park also serves as the play yard for the neighboring Lincoln School as well as nearly a dozen other downtown charter schools. From our survey, we could tell that the park is in excellent condition with no graffiti. The only thing lacking is green space. 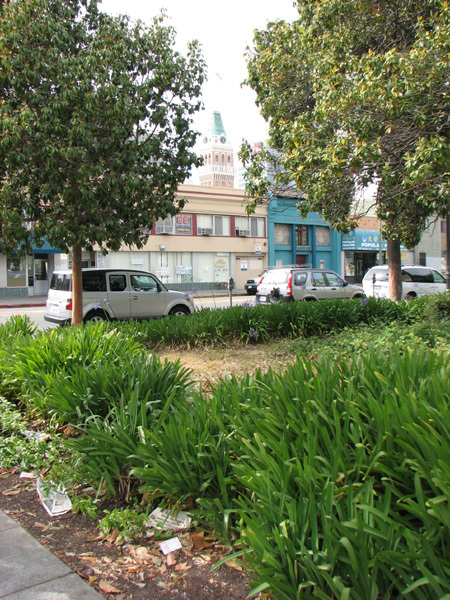 Agapanthus, a few grande flora magnolia trees and some Himalayan blackberries, an unfriendly invasive, fill the Rec Center’s front ‘yard’. 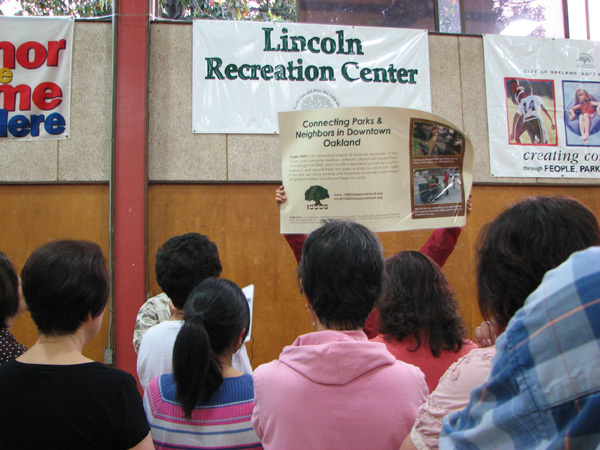 Gilbert Gong, the Rec Center’s director, showed us landscaping plans for the park that include adding picnic tables and benches as well as a butterfly garden. 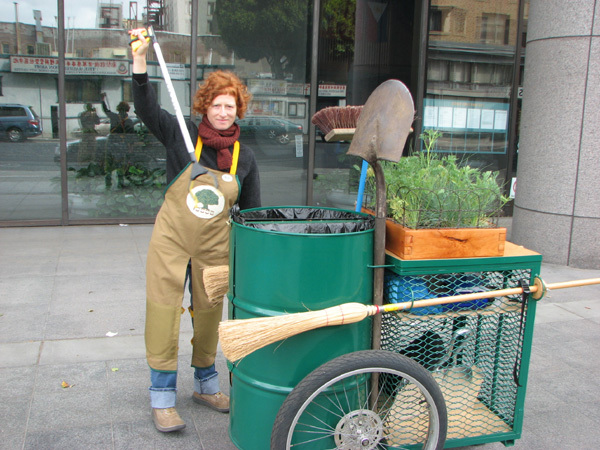 So, we agreed that we’ll work with some kids on planting a butterfly garden later this summer. 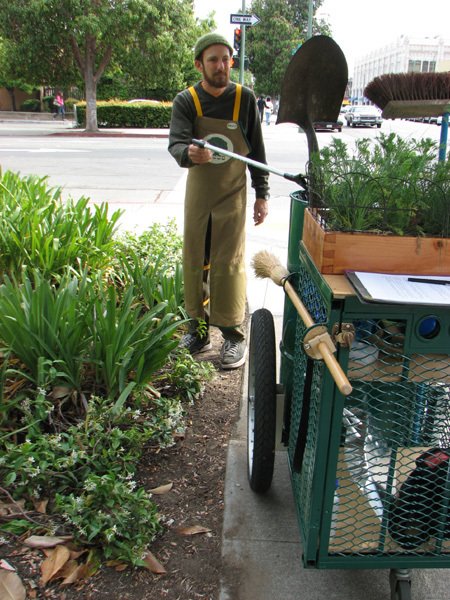 Gilbert wants help with encouraging all the hundreds of kids who use the park daily to better understand stewardship. The area can get pretty trashed. 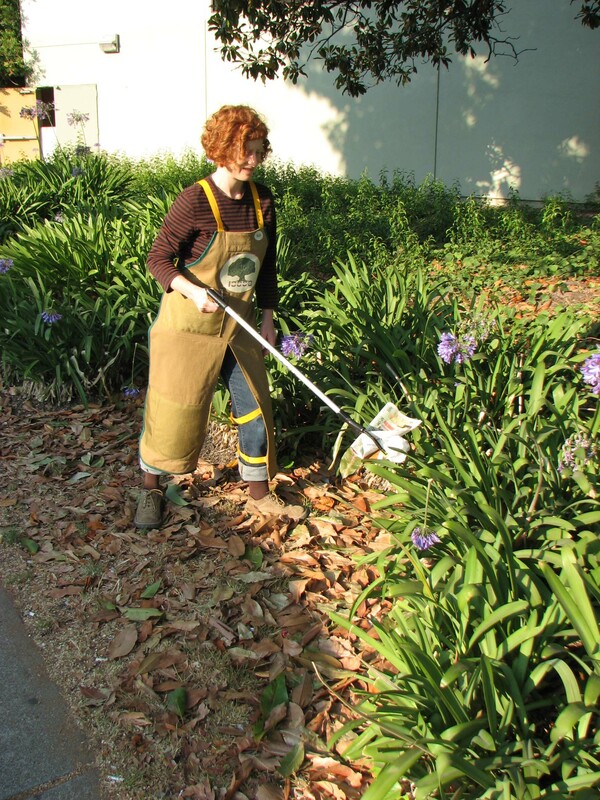 It is more than a full time job keeping the place clean. 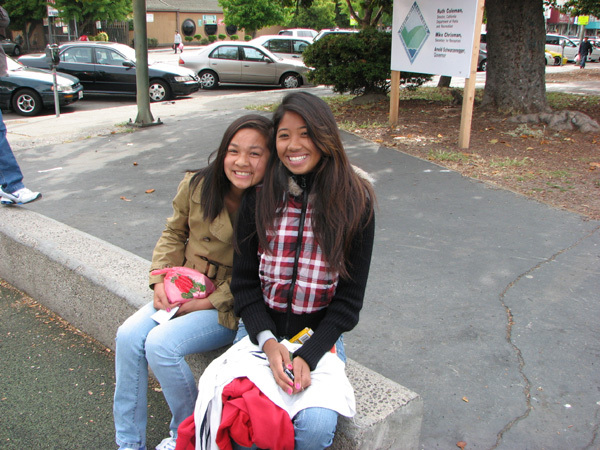 Kids from Asian Youth Services pick up trash once a month, which helps but is not enough. We’ll help with a plan to talk to kids and teachers from the charter schools in the fall. 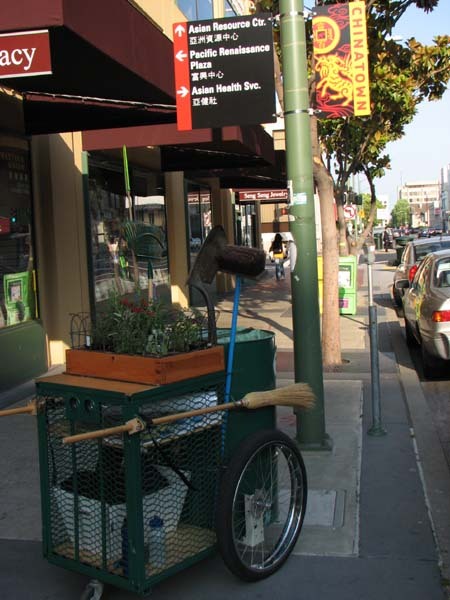 On our way back to our cart garage, Tyranny, the owner of Verse Sneaker Boutique in Old Oakland stopped us and said, “There go the city horticulturists!” He told us he thinks it is really important for kids to have a safe place to hang.